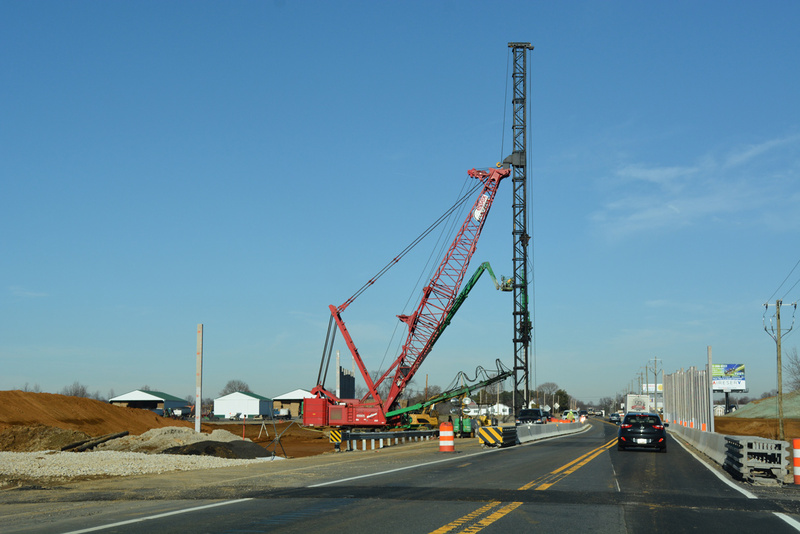 Construction of the U.S. 301 toll road across Scott Run. 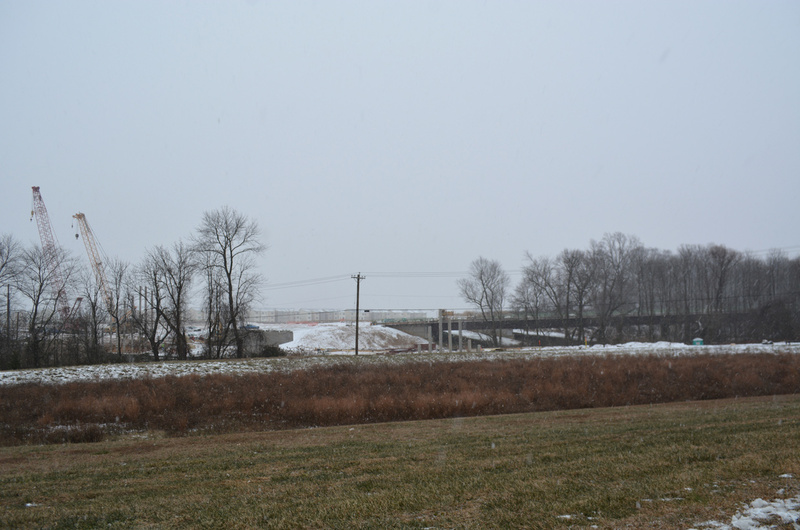 Photo taken 12/15/17. Looking southeast from Hyetts Corner Road at the future US 301 toll road. Photo taken 12/15/17. 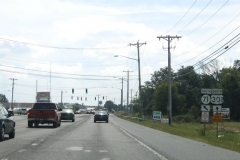 Future roadways for US 301 west of Jamison Corner Road. 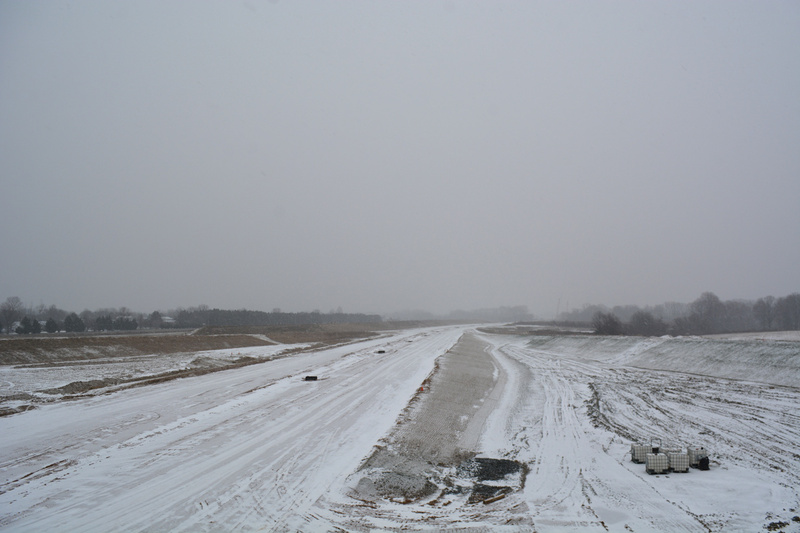 Photo taken 12/15/17. 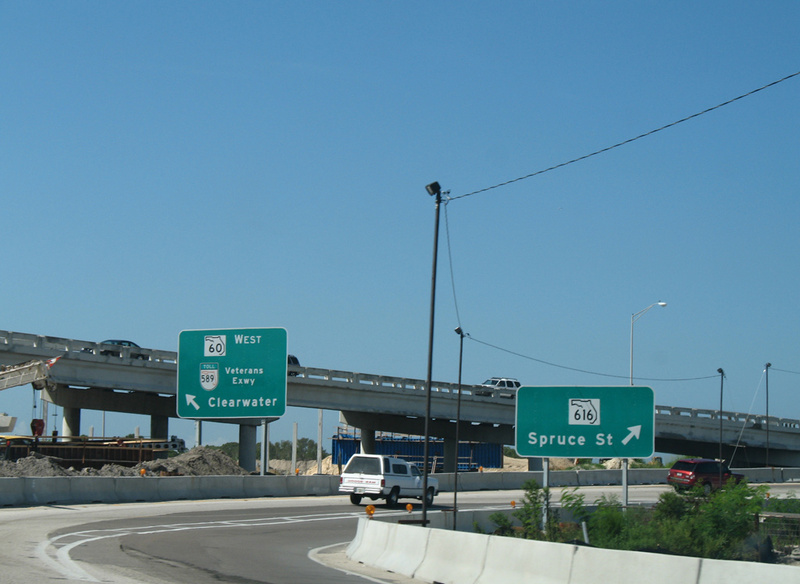 The south roundabout for the dumbbell interchange for US 301 at Jamison Corner Road. 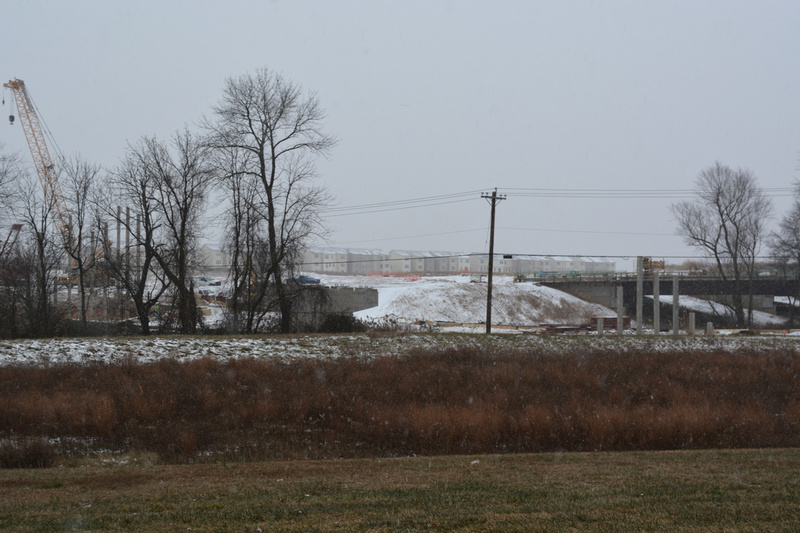 Photo taken 12/15/17. 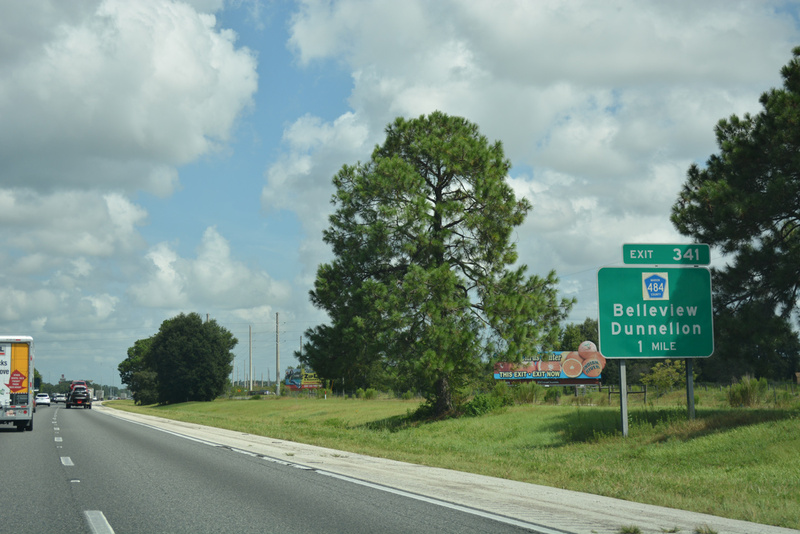 Confirming markers for U.S. 301 & Delaware 71-896 posted after their merge. 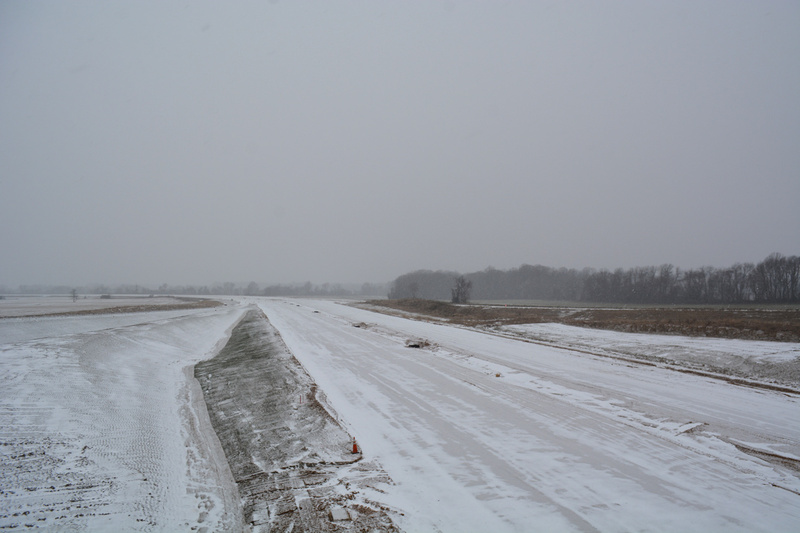 Photo taken 12/16/16. 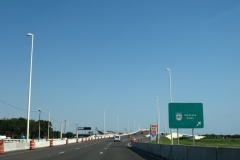 This shield assembly for U.S. 301/SR 71 was replaced in 2017, despite the pending relocation of U.S. 301 to the toll road around Middletown. Photo taken 12/20/16. Shields formerly posted after the SR 299 east merge with U.S. 301 north after Warwick Road. 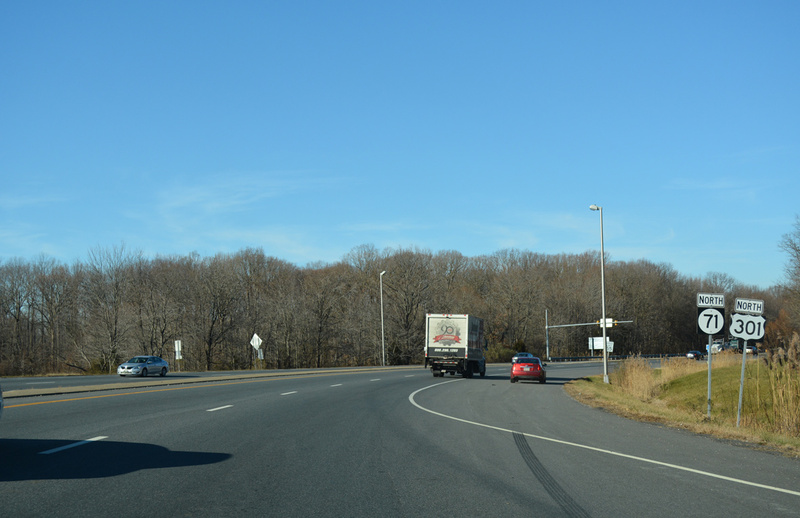 The rural character of U.S. 301 (Middletown Warwick Road) diminished as the highway heads northward. 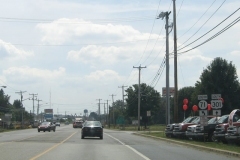 Photo taken 08/27/05. 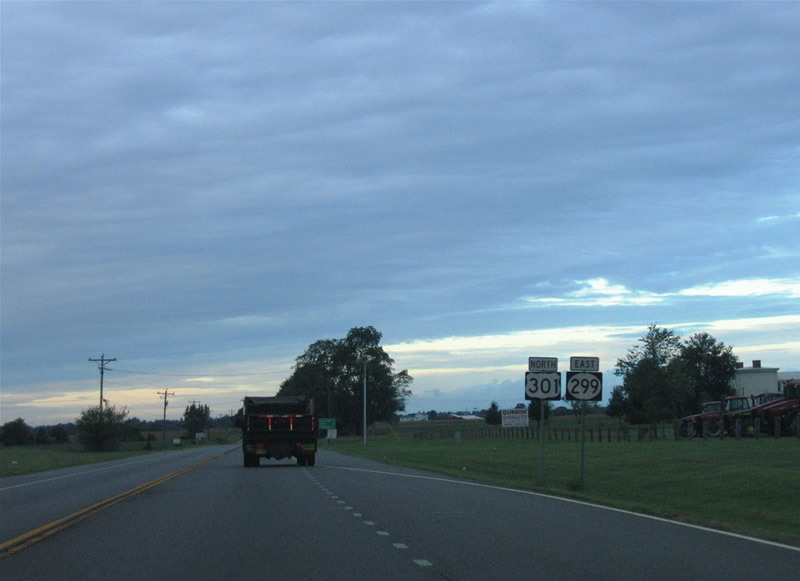 Approaching the former intersection with Delaware 15 (Levels Road) south on U.S. 301 north & Delaware 299 east. Delaware 15, signed by 1993 in New Castle County, provides an alternate route between Smyrna-Clayton and Middletown. 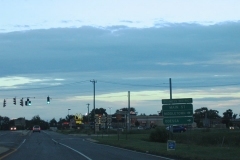 Photo taken 08/27/05. 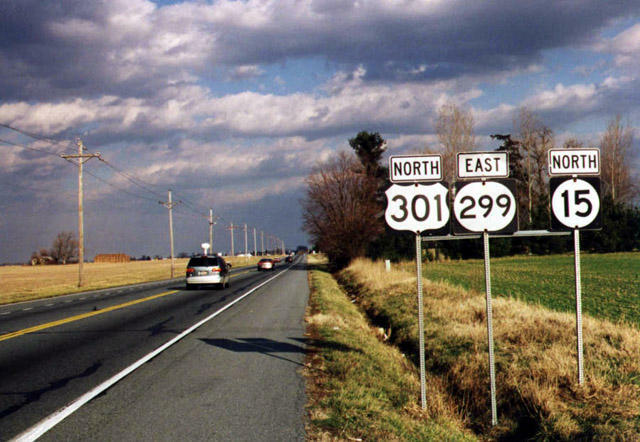 Historical look at U.S. 301-Delaware 15 north & 299 east as they advanced east along what was then a two-lane rural stretch of Middletown Warwick Road toward Middletown. 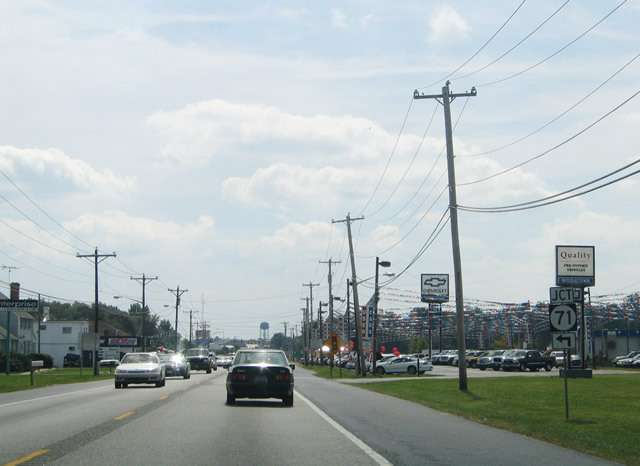 This stretch of roadway was eventually expanded into a four-lane arterial, with big box retail and an industrial park developed within the vicinity. 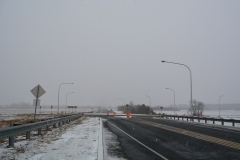 Photo taken 12/15/99. 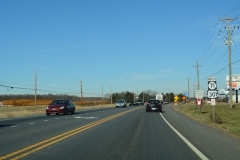 Nearing the U.S. 301 partition with Delaware 15 north (via Bunker Hill Road) and Delaware 299 east (via Main Street) in Middletown. 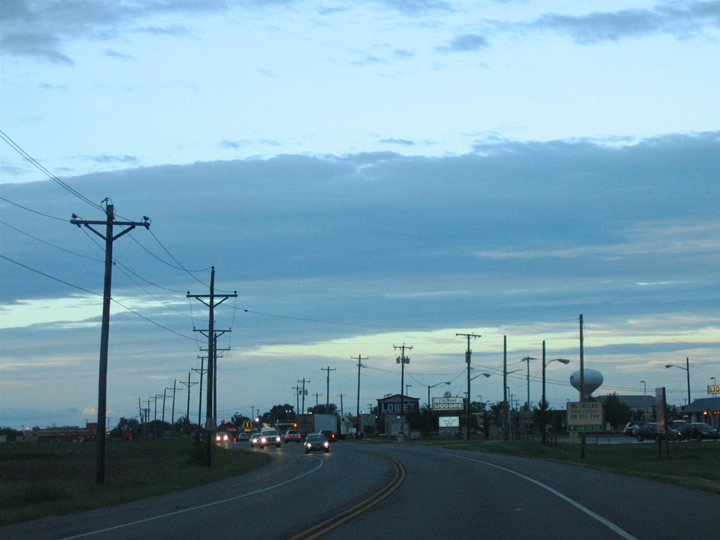 Development was well underway at the time of this photo with big box retail added to the east of U.S. 301. 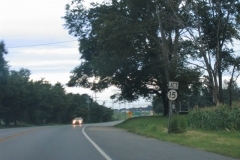 Photo taken 08/27/05. 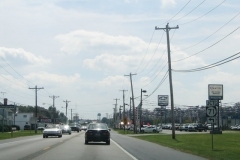 When the initial Middletown bypass for U.S. 301 was built to the west of Peterson Road, the direct transition of Middletown Warwick Road east onto Main Street was realigned so that the two met at Bunker Hill Road at a conventional intersection. 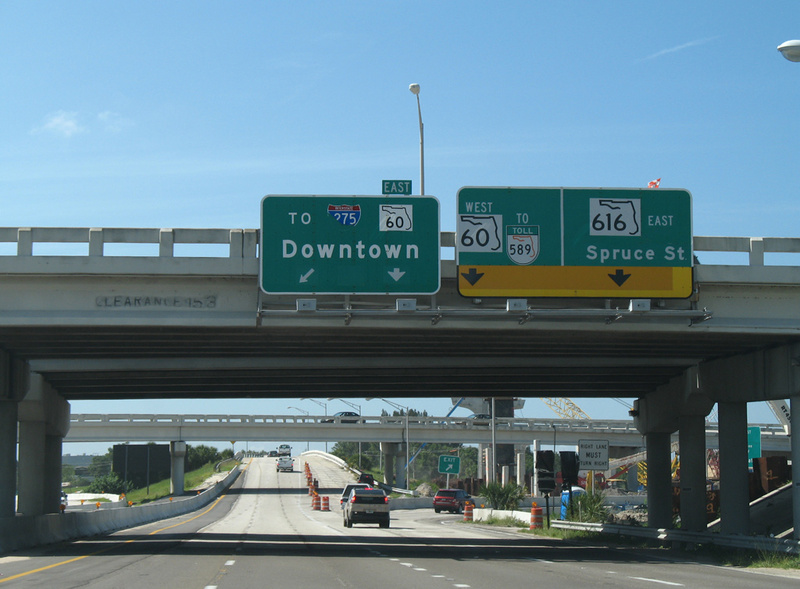 Subsequent work expanded U.S. 301 into a four-lane divided arterial. 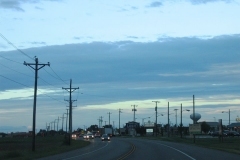 Photo taken 08/27/05. 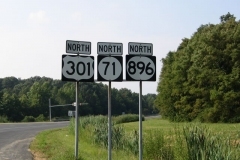 US 301/SR 71 shields posted north of Armstrong Corner Road. Photo taken 12/20/16. 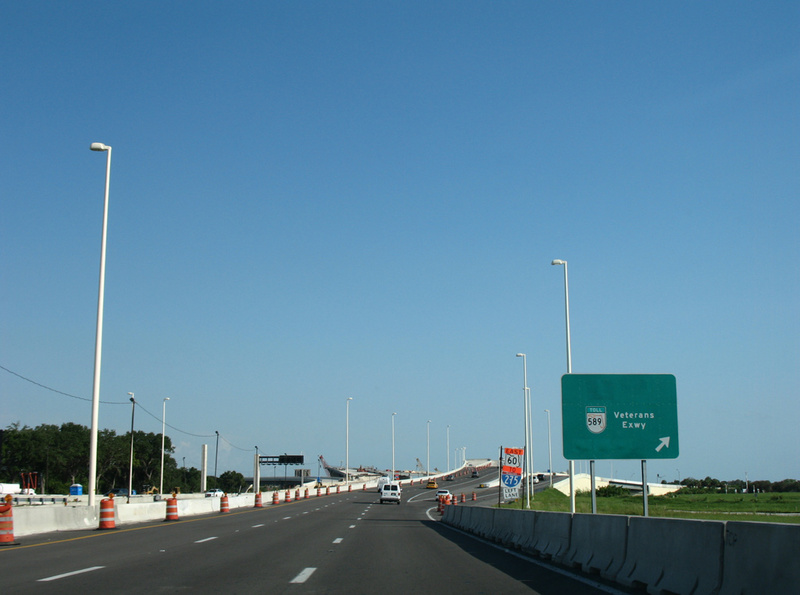 The future U.S. 301 toll road crossing over SR 71 (Summit Bridge Road) northbound. Photo taken 12/20/16. 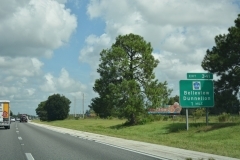 U.S. 301 & Delaware 71 north at Delaware 896 (Boyds Corner Road) in Mount Pleasant. 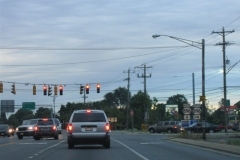 This view looks at Summit Bridge Road prior to an intersection expansion project widening the road four lanes on the approach. 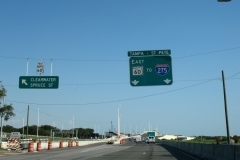 Photo taken 08/27/05. 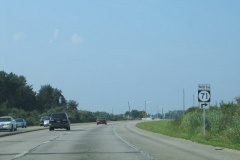 A previous shield array for U.S. 301 & Delaware 71-896 north at Mt. Pleasant. 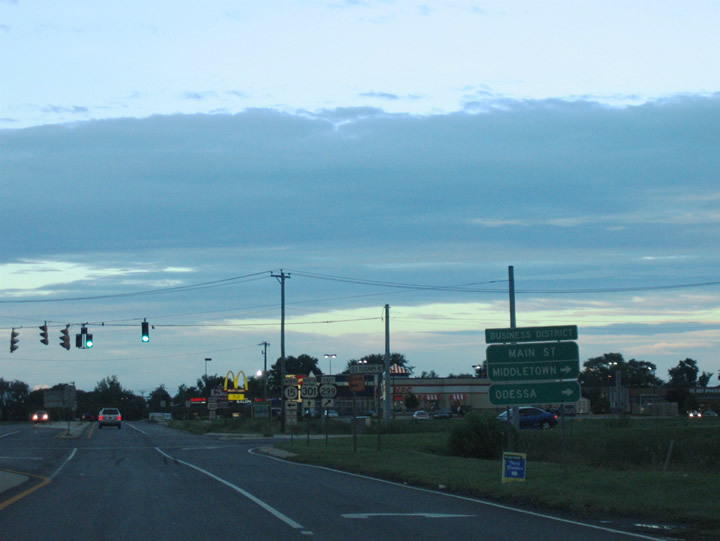 Photo taken 08/27/05. 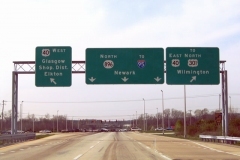 Four-lane expansion of Delaware 896 between Mount Pleasant and Newark by 1996 provides a direct ten mile route to both Interstate 95 and the city of Newark from areas south of the C & D Canal. 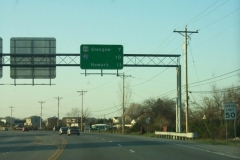 Photo taken by Kevin J. Sylvester (02/29/00). 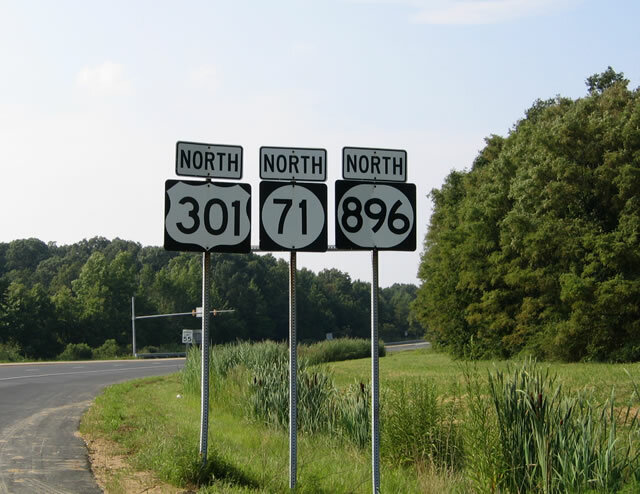 This set of shields showed the correct order of U.S. 301, Delaware 71 and Delaware 896 until it was replaced by 2012. 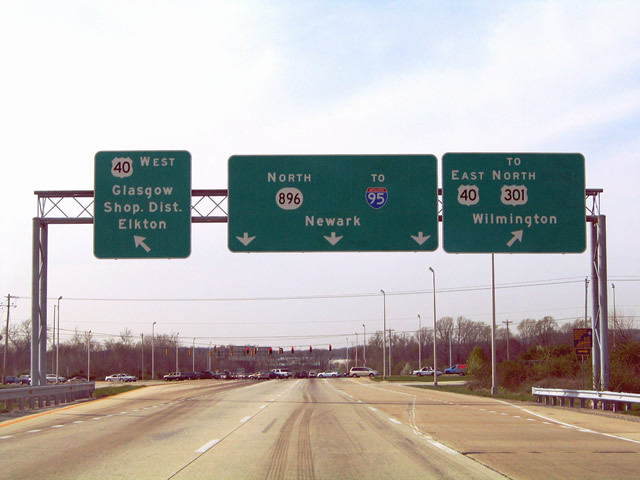 U.S. 301 was reassigned to Delaware 896 north to Glasgow in 1993. Photo taken 08/10/04. 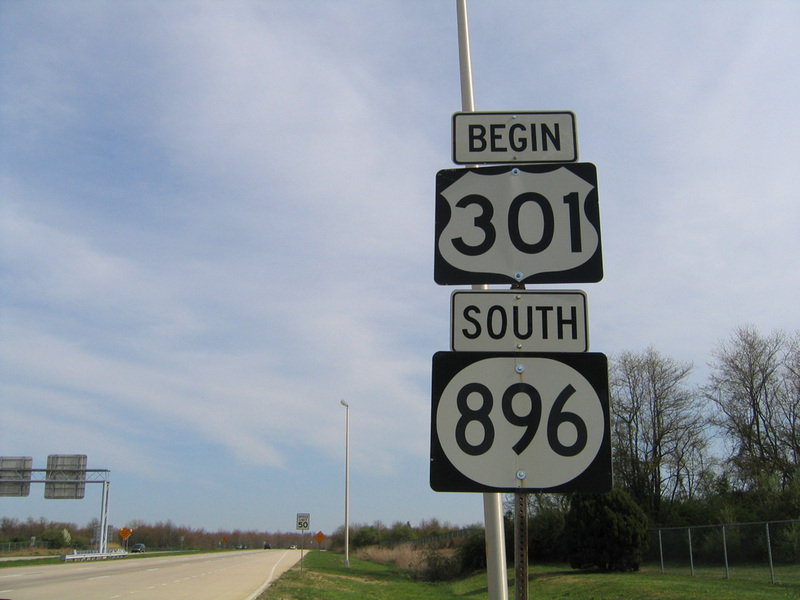 The Delaware 896 shield along Summit Bridge Road north of Delaware 15 went missing by 2016. Photo taken 06/10/12. This shield was formerly posted ahead of the right-hand turn of SR 71 north onto Red Lion Road. 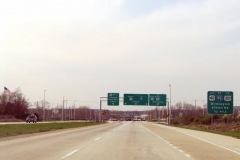 Until 1983, SR 71 carried U.S. 301 South from U.S. 13 at Tybouts Corner to Delaware 896 and the Summit Bridge. Photo taken 08/10/04. 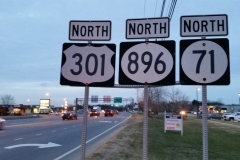 New guide signs installed in 1994 at the junction of U.S. 40, U.S. 301 and Delaware 896 in Glasgow continued to reflect the pre-1993 alignment of U.S. 301 along U.S. 13 to the east. 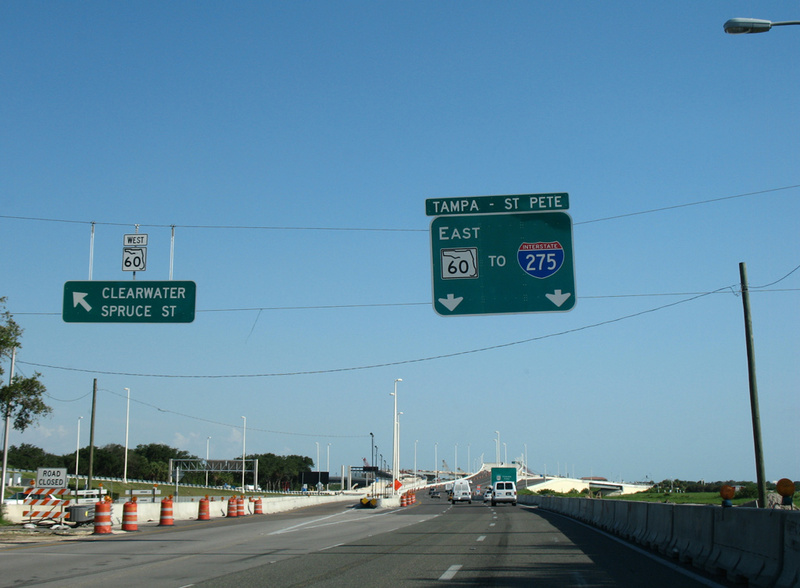 Replacement signs amended the U.S. 301 reference to reflect U.S. 13, but continued to show I-95. 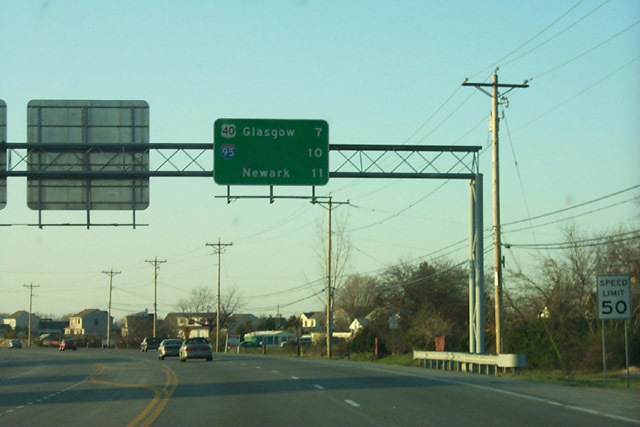 Photo taken 04/17/04. 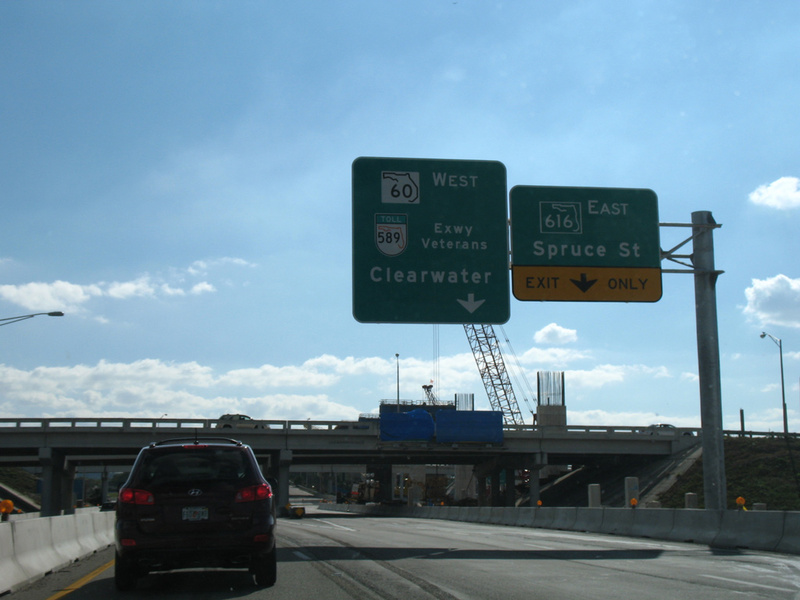 Replaced overheads posted on U.S. 301 & SR 896 north at U.S. 40. The empty space on the right-hand panel once displayed "TO Interstate 95 North." 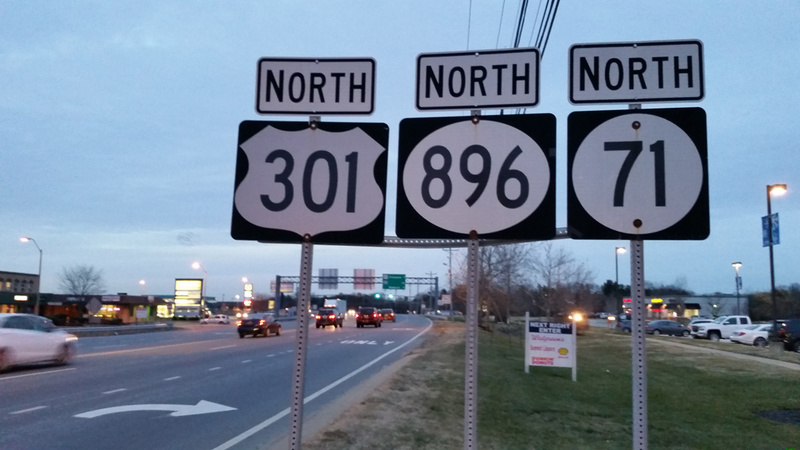 DelDOT amended the signs to direct all I-95 bound traffic on SR 896 north instead of partitioning it via U.S. 40. 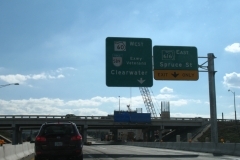 A greenout was later applied on new signs over the U.S. 301 error for U.S. 40 east as well. 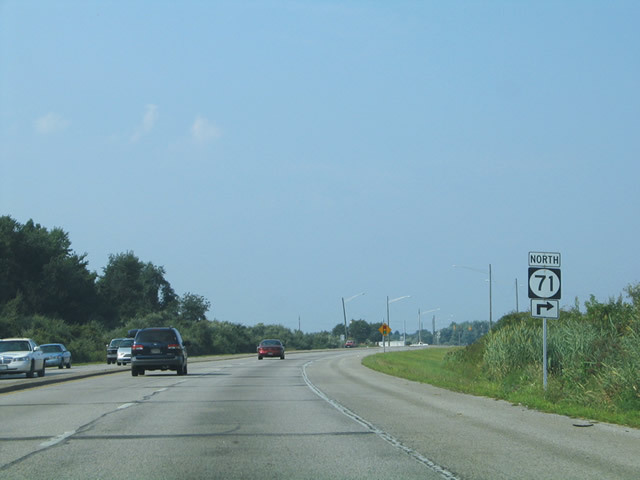 Photo taken 04/17/04. 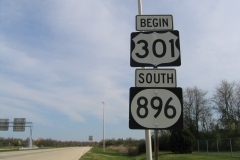 A begin sign for U.S. 301 south was installed along Delaware 896 at Glasgow by 2004. 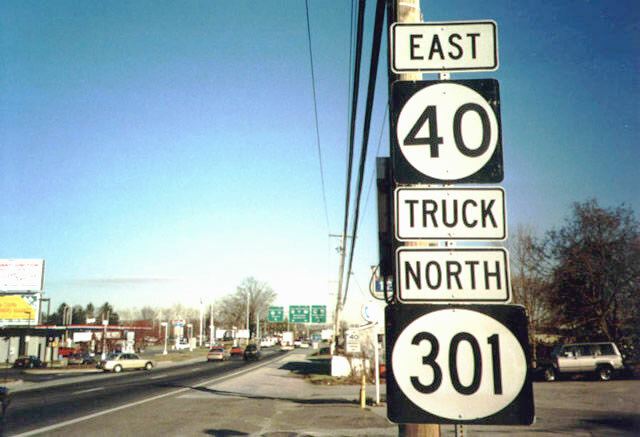 The U.S. 301 reference however was removed by 2012. Photo taken 04/17/04. 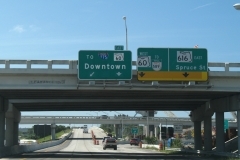 Entering northern reaches of the Middletown limits, U.S. 301 and Delaware 71 (Summit Bridge Road) approached their split at North Broad Street. 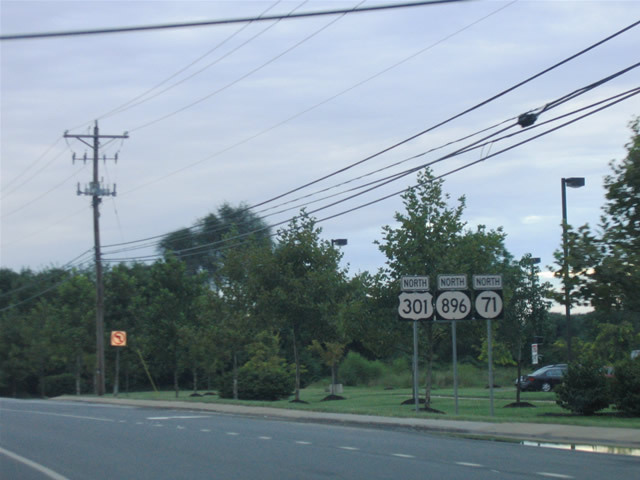 Photo taken 09/25/04. Delaware 71 takes North Broad Street south from U.S. 301 directly to Downtown Middletown. 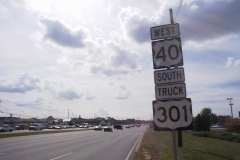 U.S. 301 followed Peterson Road parallel to the Norfolk Southern Railroad tracks until 1994, when the four-lane arterial bypass was completed to the west. 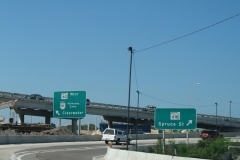 Photo taken 09/25/04. U.S. 301 shifted westward toward Middletown Warwick Road as Delaware 71 bee lined for Downtown. 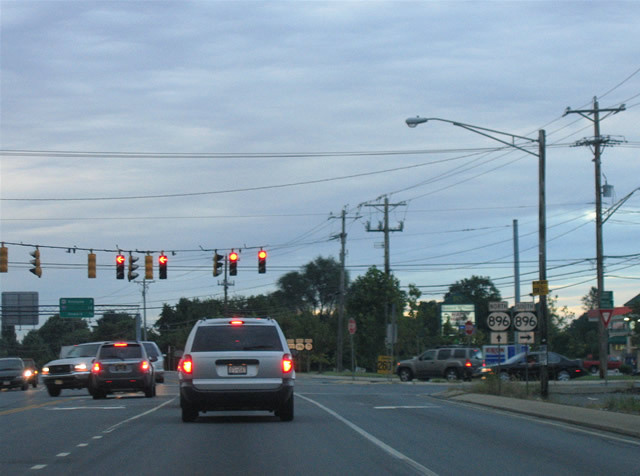 Photo taken 09/25/04. 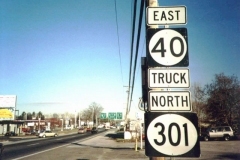 This set of erroneous SR 40 and 301 Truck shields were posted just east of SR 896 Business (Glasgow Avenue) in Glasgow. 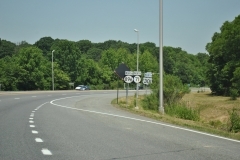 This assembly was replaced with a U.S. 40 marker by 2001 and then subsequently removed. 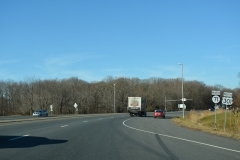 Photo taken 12/99. 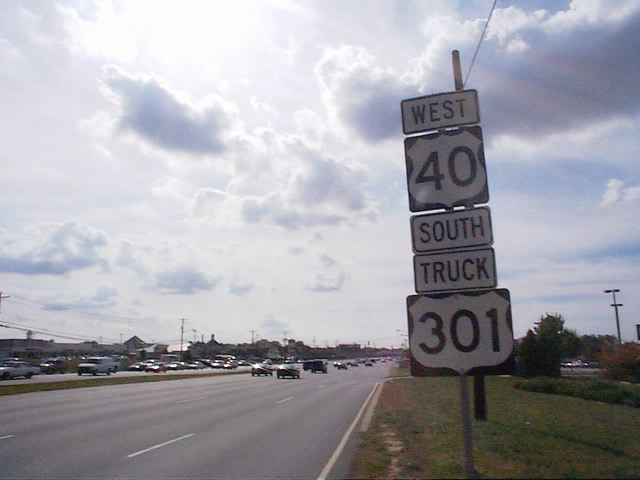 U.S. 40/301 Truck shields posted west of SR 7 at Bear. 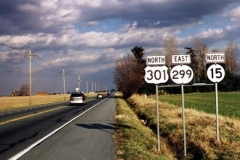 Signs for the bannered route remained in place until at least 2001, despite the relocation of U.S. 301 in 1993. 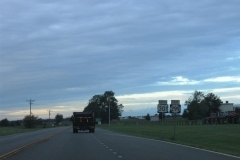 Photo taken 10/09/01.